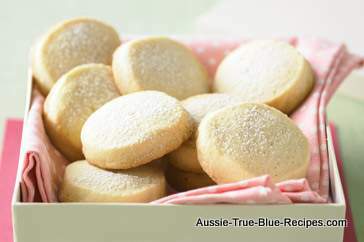 Beat butter, vanilla and 1/3 cup sifted icing sugar in a small bowl with electric mixer until light and fluffy. Add milk; beat until combined. Add sifted flour and cornflour; beat on low speed until combined. Refrigerate biscuit dough about 10 minutes or until firm enough to roll. Roll dough into a 30cm log; wrap in plastic. refrigerate dough 1 hour. Cut dough into 4mm slices. Place slices on trays 3cm apart. Bake about 10 minutes or until just golden. Stand biscuits on trays 5 minutes before transferring to wire racks to cool slightly. While still warm, dust biscuits liberally with remaining sifted icing sugar. Cool completely on wire racks and store in airtight container.